O Jamadagni! You alone can uphold righteousness in the world by your effulgent third eye that you had attained by your strict penance! Sage Jamadagni was a Brāhmaṇa (one who preserves the Veda and imparts its teachings to the world) by birth, and he belonged to the lineage of Sage Bhṛgu, one of the Prajāpatis created by Lord Brahmā. He was the son of Sage Rucika and Satyavatī, the daughter of the Kṣatriya (warrior) king Gadhi. He fathered five sons, the youngest of whom was Paraśurāma, the sixth incarnation of Lord Viṣṇu. The wise sage was well versed in the Vedas and the art of weaponry. He never had a formal instruction on these but acquired the knowledge of all these by himself. He was an ardent devotee of Lord Śiva and was ever engaged in meditation upon him. His wife Reṇukā, the daughter of King Prasenajit of the Solar dynasty, was known for her chastity and devotion. The story of the birth of Sage Jamadagni is an interesting one. His father once offered a concoction to Satyavatī in order for her to give birth to a son who would be born with all the qualities of a Brāhmaṇa, possessing only the Sattvic energies. 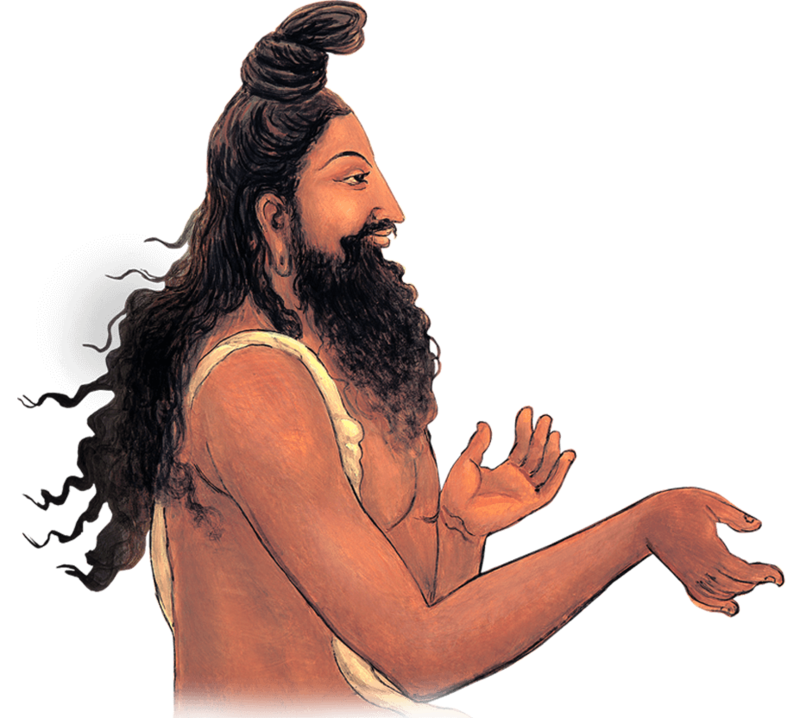 The son was none other than Jamadagni, the sage who is known for his Sattvic nature that was predominant in him. Nevertheless, he gave into anger once, when he learnt from his divine vision that his wife Reṇukā had tainted her chastity. The pious woman, who was always engaged in the service of her husband with utmost devotion, used to fetch water for him from the river every day in a pot made of unbaked clay. One day, while she was fetching water from the river, she spotted a Gandharva traversing through the sky on a chariot. For a brief moment, she was smitten with desire for him, and the unbaked pot that she was holding in her hand dissolved into the river. Overcome with guilt and fear, she waited on the river bank. She knew that she would be punished for her misdeed, and she was ready to accept the curse that Sage Jamadagni would unleash upon her. Meanwhile, back at the hermitage, Sage Jamadagni was waiting for Reṇukā to bring the water, so that he could commence his morning rituals. When she did not return for long, the sage used his Yogic powers and discerned all that had happened on the river bank. Overcome with fury, he called his eldest son to execute Reṇukā for her misdeed. His son refused to perform the execution. He then commanded his other sons to carry out his orders. None of them heeded to his command, except his youngest son Paraśurāma who executed his mother as well as his other brothers who disobeyed his father’s orders. Pleased by this act, the sage offered a boon to Paraśurāma who asked him to restore the lives of his mother and brothers. The devotion and affection of Paraśurāma impressed the sage that he instantly granted him the boon. What made the sage, who possessed the purest of qualities, furious? During the Vedic period, the sages usually set an example of following the path of Dharma (righteousness) to the rest of the beings. They were considered the purest of souls who were ever engaged in virtuous deeds, and the members of their families were equally virtuous. Hence, though they were compassionate, they had the right to punish those who transgressed the righteous path. This was the reason that the sage chose to execute his own wife. Once, the king of Haihaya, Kārtavīrya Arjuna, who was known for his thousand hands, visited the hermitage of the sage. In order to entertain the king, the sage offered him a big, sumptuous feast with the help of his divine cow Surabhī that he had acquired by performing austerities for years. The king was overcome with the desire to own the cow, which the sage refused. He then forcibly took the cow with him and told the sage that he could get her back by means of war. Though the sage was not willing to enter into a combat with the king, his son Paraśurāma confronted the king and killed him. He then retrieved the cow by wiping out the entire army of the king. Later, in order to seek revenge, the king’s sons visited Sage Jamadagni’s hermitage and killed him during the absence of his wife and sons. Enraged by this, Paraśurāma killed the three brothers who killed his father and went on a rampage of killing the men belonging to the Kṣhatriya clan. He intended to wipe out the entire Kṣhatriya clan for twenty-one generations because his father was stabbed twenty-one times by the sons of Kārtavīrya Arjuna. The life of the great sage was however restored by the grace of Lord Shiva, and he continued to live on earth, performing austerities and engaging in the welfare of the world.